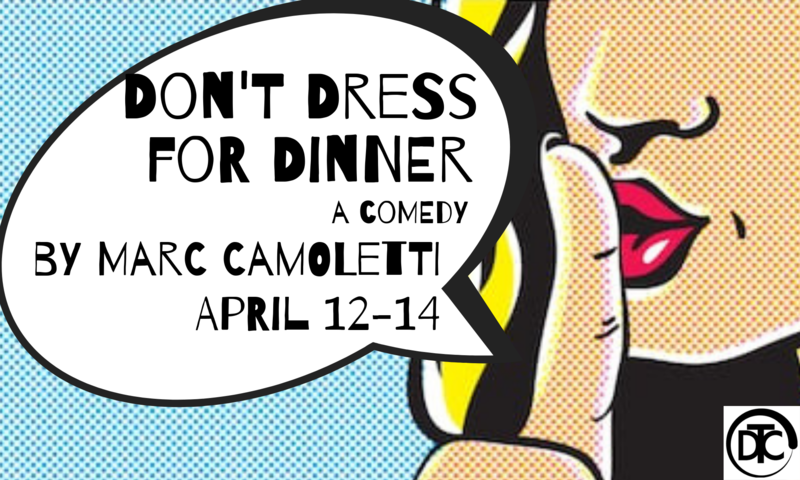 Dunstable Theater Collaborative is seeking actors for our upcoming romantic comedy, Don’t Dress for Dinner by Marc Camoletti. Auditions will be held at Dunstable Town Hall, 511 Main Street, Dunstable, MA on January 15 and 16 from 7-9 pm. Please bring a headshot and acting resume if you have them. Auditions will consist of cold reads from the show sides. Call-backs will be January 17 from 7-9 pm. Rehearsals begin February 4 (M, W, Th). Performances are April 12-13 at 7:30 pm and April 14 at 3 pm. Love Letters is a play by A. R. Gurney that was a finalist for the Pulitzer Prize for Drama. The play centers on two characters, Melissa Gardner (played by Karen Majkut) and Andrew Makepeace Ladd III (played by Bill McCann). They sit side by side at tables and read the notes, letters and cards – in which over nearly 50 years, they discuss their hopes and ambitions, dreams and disappointments, victories and defeats – that have passed between them throughout their separated lives. Join us for this poignant piece of theater – 2 shows only! 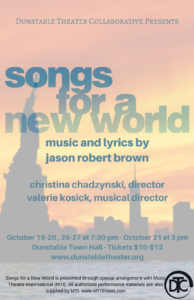 Dunstable Theater Collaborative is proud to bring the community our first musical endeavor: Songs for a New World by Jason Robert Brown, directed by Christina Chadzynski and Valerie Kosick. Join us October 19-21, 26-27 for a wonderful show with some incredible local talent – Buy your tickets today! With a rousing score that blends elements of pop, gospel and jazz, featuring tight harmonies and darling vocals, Songs for a New World transports its audience from the deck of a Spanish sailing ship bound for a new land, to the ledge of a New York penthouse. Characters range from a young man in the Bronx who dreams of becoming a famous basketball player, to a forlorn and neglected Mrs. Claus lamenting as Christmas approaches. A small but powerful cast and a supercharged, well-crafted score appeal to old and new generations alike as each character — in their own way — takes hold of that one moment and enters a new world. Strobe lighting effects and adult language will be used during this performance. Patrons that may suffer from epilepsy & other visual light stimulation effects are advised to contact the Front of House staff prior to entering the hall. We are auditioning male and female vocalists for Songs for a New World by Jason Robert Brown. The show calls for 2 men (one baritone, one tenor) and two women (one alto, one soprano). Ages are very flexible! Depending on the amount of actors/singers that audition for the show, we may double the cast from 4 to 8 in order to involve more of the community. July 16, 19, 23 at 6 pm at Dunstable Town Hall with callbacks on July 26. You can sign up for any of these days by emailing us at dtcauditions@dunstabletheater.org and we will give you a time slot to come in between 6 and 9 pm. You will need to prepare an audition song. More info available via email. Rehearsals will begin August 6, and will be held Monday and Thursday nights from 6-9 pm at Dunstable Town Hall. Performances will be October 19-21, 26-27. A theatrical piece of distinct power, with some of Tennessee Williams’ most potent lyricism, The Glass Menagerie is a memory play as told to us by Tom Wingfield, a merchant marine looking back on the Depression years he spent with his overbearing Southern genteel mother, Amanda, and his physically disabled, cripplingly shy sister, Laura. While Amanda strives to give her children a life beyond the decrepit St. Louis tenement they inhabit, she is herself trapped by the memory of her life past– a life of cotillions and suitors and wealth, now long gone. Tom, working at a shoe factory and paying the family’s rent, finds his own escape in drinking and going to the movies, while Laura pours her energy into caring for her delicate glass figurines.. Tom, pressured by his mother to help find Laura a suitable husband, invites an acquaintance from the factory to the apartment, a powerful possibility that pushes Amanda deeper into her obsessions and makes Laura even more vulnerable to shattering, exposed like the glass menagerie she treasures. Williams’ intensely personal and brilliantly tender masterpiece exposes the complexity of our memories, and the ways in which we can never truly escape them. 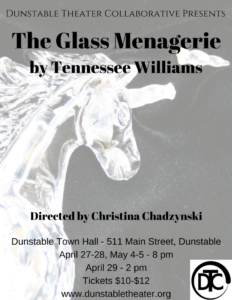 Dunstable Theater Collaborative is hosting auditions for Tennessee Williams’ The Glass Menagerie. Auditions are on 2/15, 2/21 & 2/22 from 6PM until 9PM, with possible callbacks the following week at Dunstable Town Hall, 511 Main Street. Rehearsals begin 3/05 and will take place Monday and Wednesday evenings through March, and adding Friday evening rehearsals in April. Performances will be April 27-29 and May 4-6. Auditions will consist of readings from selected sides from the script. No appointment is necessary, but an RSVP is appreciated at auditions@dunstabletheater.org. Actors only need to attend one of the audition nights. Amanda Wingfield – A faded Southern belle, abandoned by her husband, who is trying to raise her two children under harsh financial conditions. Amanda yearns for the comforts of her youth and also longs for her children to have the same comforts, but her devotion to them has made her – as she admits at one point – almost “hateful” towards them. Tom Wingfield – Amanda’s son. Tom works at a shoe warehouse to support his family but is frustrated by his job and aspires to be a poet. He struggles to write, all the while being sleep-deprived and irritable. Yet, he escapes from reality through nightly excursions to the movies, but also to local bars. Tom feels both obligated toward yet burdened by his family and longs to escape. Laura Wingfield – Amanda’s daughter and Tom’s older sister. A childhood illness has left her with a limp, and she has a mental fragility and an inferiority complex that have isolated her from the outside world. She has created a world of her own symbolized by her collection of glass figurines. Jim O’Connor – An old high school acquaintance of Tom and Laura. Jim was a popular athlete and actor during his days at Soldan High School. Subsequent years have been less kind to Jim; however, and by the time of the play’s action, he is working as a shipping clerk at the same shoe warehouse as Tom. His hope to shine again is conveyed by his study of public speaking and ideas of self-improvement that appear related to those of Dale Carnegie. 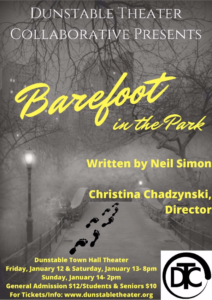 Neil Simon’s Barefoot in the Park is a romantic comedy focusing on a pair of newlyweds, Corie and Paul Bratter, as they begin married life in a tiny, 5th-floor walkup apartment in a Greenwich Village brownstone. Paul is a strait-laced attorney; Corie has a far more spontaneous, free spirit. As the young couple contend with a lack of heat, a skylight that leaks snow, several long flights of stairs, oddball neighbor Victor Velasco, and Corie’s well-meaning mother Ethel Banks, they must also reconcile their own personal differences in how they approach life’s challenges. Adjusting to married life isn’t so easy! 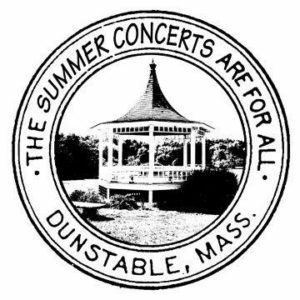 Come by and say “Hello” to us at the Dunstable Summer Concert Series on August 9th at 6:30PM. It is Community Info Night, and we will have a table set up with pamphlets and sign-up sheets, as well as some other goodies. Enjoy an evening of music from The Rampage Trio at Dunstable’s final concert of the series and summer – we’ll see you there! ing a number of musical selections, because what is more American than Musical Theater? 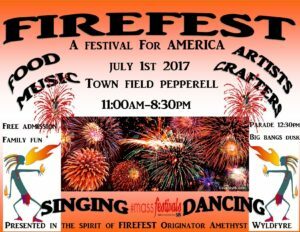 Our festival performance is on July 1st at 4pm on Peperrell’s Town Field on the second stage. For more information or to find out how to be a part of the show, contact us! 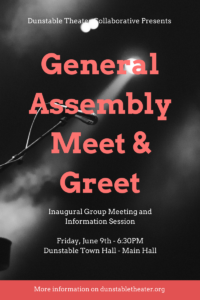 On Friday, June 9th at 6:30 in the Dunstable Town Hall Theater (Main Hall), we will be holding a general assembly meeting for all members of Dunstable and surrounding communities who are interested or curious about Dunstable Theater Collaborative. We plan to discuss the group origin and mission, as well as lay out our plans for shows in the coming year. We want to take this opportunity to begin to make connections with community members who are passionate about theater and performance in one way or another, whether it is on stage or behind-the-scenes. This meeting is also for anyone who wants to be involved in bringing more arts and culture to our wonderful town, including future audience members. There will even be live performances by members of our founding board of directors to help shine a light on what is coming down the road with this newly incorporated non-profit community theater organization. We hope to see you there for a memorable evening.